Happy Friday! I hope your week has been amazing! Today, I'm rounding up my weekly picks for what I am currently loving. 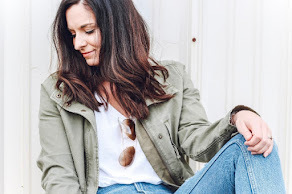 While I was working on this roundup, I thought it would be super fun to put together a spring capsule wardrobe for y'all. I know many of you are busy moms likes me so I that might be helpful for many of you. Would anyone be interested in seeing something like that? Of course, it would be filled with budget friendly, comfortable yet put together pieces. Let me know what you think! 1. Front Tie Top | This top doesn't really look like much on the hanger but it's gorgeous and so flattering when you put it on! It comes in three colors and fits true to size. This dark gray color is my favorite! Oh and it's under $20! 2. Hair Ties | These hair ties are a total game changer in terms of pulling your hair back. I can't use anything else now that I have discovered these gems! They are so perfect for top knots and don't leave crazy creases in your hair. 3. Sunglasses | Classic aviator shades will always be my go-to for sunglasses! I can't live without sunglasses so I have so many affordable pairs all over my house and in my car so that I'm always prepared for a sunny day. 4. Bangle | I love the simplicity of this bracelet. Simple statement pieces are always my absolute favorite kind of jewelry to wear. 5. Striped Tee | Y'all know I love stripes so this cute tee caught my eye as soon as I saw it online. It also comes in two other cute colors for spring. Yay for stripes! 6. Crossbody Bag | Round bags are my favorite for spring! I think the shape is just so fun and eye catching. I love the style and the neutral colors on this one. So perfect for any springtime look! 7. Espadrilles | I bought this exact pair of espadrilles in the cognac color two years ago and I still love them! They are such a comfortable sandal that gives you height without sacrificing comfort. I'm all about that! I need this pretty rose blush color in my life, too. 8. Jeans | High rise jeans are a mom's best friend. No matter how many crunches or sit ups I do, I still have a mom tummy so jeans that tuck everything in neatly is where it's at. I love the button detail and the raw hem. Such a cute, budget friendly pair of jeans!